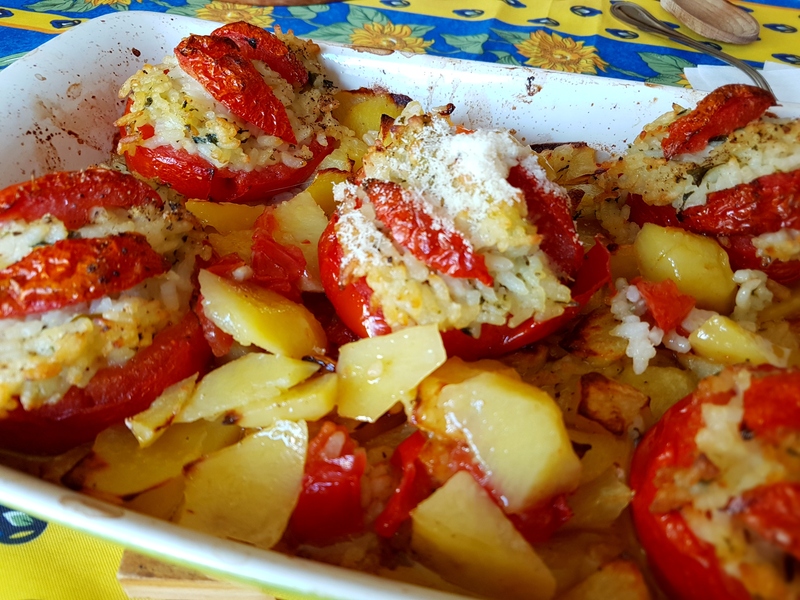 This recipe for rice-stuffed tomatoes was originally my Nonna Wanda’s recipe, with the addition of potatoes made by my Zia Emilia to make it more authentically Roman. Start by cutting the potatoes. 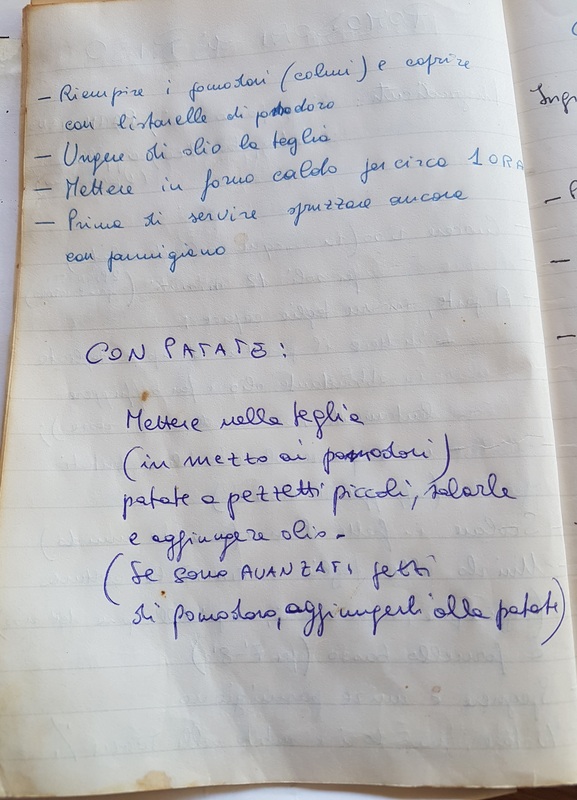 Ideally, do these the Italian way (watch video) – this allows them to cook slightly unevenly, giving you lovely crispy edges and soft centres. Tip: Cutting potatoes this way and roasting them with rosemary and olive oil is a delicious Italian way to do roast potatoes! Place these into an oven dish and set aside for now. Then cut the tops off the tomatoes (think little ‘hats’). Slice two thin strips off the ‘discarded’ tomato tops and set aside (you’ll use these later for decoration, to top your stuffed tomatoes), and chop up the remaining ‘discarded’ tops into small pieces. Add these small pieces to the potatoes. Season the potatoes and tomato pieces with a generous sprinkling of sea salt, add a generous glug of olive oil, toss, and place in a pre-heated oven (fan-assisted 180­°C) for 25 minutes. Place the rice in cold water, add a generous sprinkling of sea salt, and bring to the boil, then reduce to a simmer and cook for 10 minutes or so (check this as not all rice cooks at the same rate – you want to make sure the rice is still a little bit uncooked at the end of this stage). While the rice is cooking, finely chop the half onion and soften it in a pan with a generous amount of olive oil, over a low heat (let the onion soften slowly, making sure it does not go brown). Finely chop the parsley and basil, and add these to the onion just as the rice is nearly ready at the not quite cooked stage. Make sure you don’t fry the herbs for too long. Drain the rice, leaving it quite wet, and saving the cooking water. Add the rice to the pan with the olive oil, onion and herbs and stir, letting the rice continue to cook like a risotto. You may need to add some of the cooking water to allow it to remain moist and cook until it is cooked, but still ‘al dente’. Make sure you don’t over-stir as this breaks up the rice grains. Take it off the heat once it’s cooked and stir in about 2/3rds of the parmesan cheese. Set aside. Return to the tomatoes you previously removed the tops from. Carefully hollow these out with a spoon (the insides with the seeds are my favourite part of the tomato – I always used to eagerly await this stage when my Nonna made stuffed tomatoes, and still do when my Zia does them, so I could eat them, seasoned with a bit of salt). Lightly season the insides of the hollow tomatoes with a sprinkling of sea salt. Once the potatoes have had about 25 minutes in the oven, take the oven dish out and give them a bit of a stir. Turn the oven down to 150°C (fan). Take each hollow tomato and fill it as high as you can with the cooked rice mixture. Make a space amongst the potatoes and place the tomato in that space. Repeat with each tomato, then sprinkle some parmesan onto each stuffed tomato and, finally, top each one with two strips of the tomato ‘lids’ you cut out earlier. 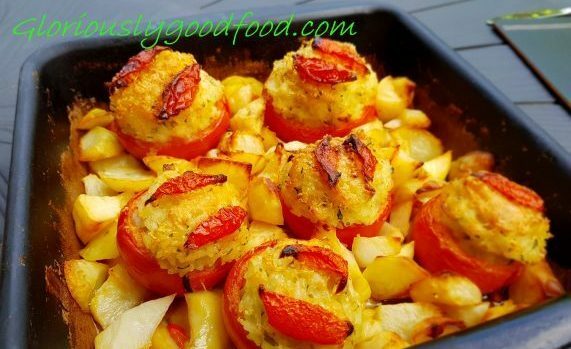 Place the dish back into the oven and bake until the tomatoes are very soft and the rice has a crispy parmesan topping. The potatoes should be cooked and golden, not overly brown. This takes approximately 40-45 minutes. Serve on their own, as a side-dish, or as a starter. These are also delicious once they’ve cooled down a little to luke-warm. Cacio e Pepe (Cheese and Pepper) is a simple, yet delicious way to serve pasta. 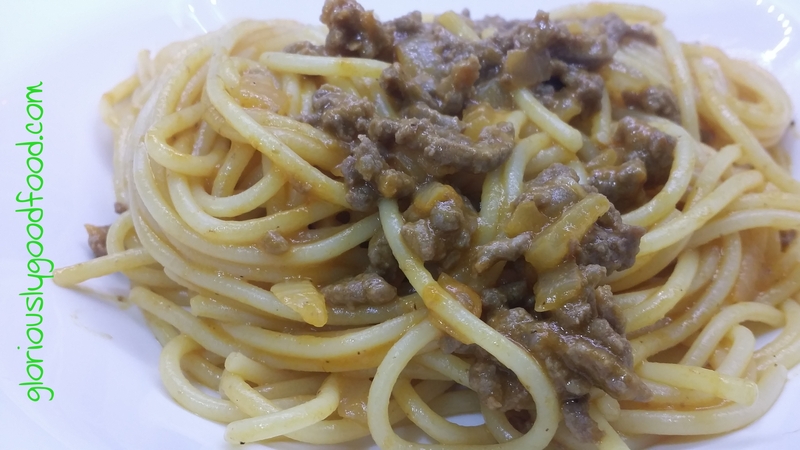 It is a typical dish from Rome, and can be served with spaghetti, linguine, or even short pasta such as rigatoni. 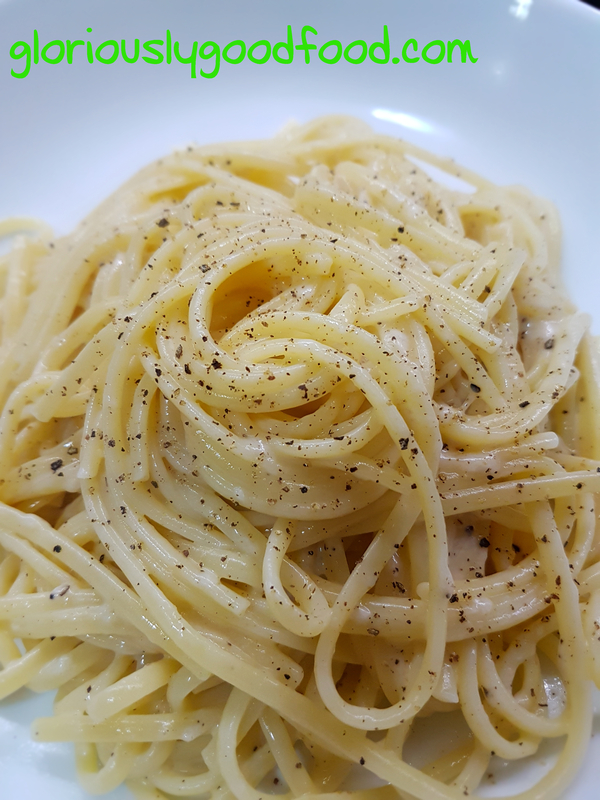 On this occasion, I made Linguine Cacio e Pepe. Put a large pan with water, a drop of oil and a fistful of salt on the hob and bring to the boil. I usually advocate using the largest possible stockpot style pan for pasta cooking, but this recipe works best if you have very starchy water, so use a slightly smaller (but still ample) pan / less water than you usually would for pasta. Once the water is boiling, add the pasta, stir after a minute or so, and occasionally during cooking, to ensure it doesn’t stick together. While the pasta is cooking, finely grate the pecorino cheese. The key to this recipe is the cheese. Make sure you use a good quality pecorino romano and that you grate it as finely as you can – this will enable you to create the creamy sauce. If the cheese is too coarsely grated, it won’t go creamy and will clump instead. Grind plenty of black pepper into the pecorino. 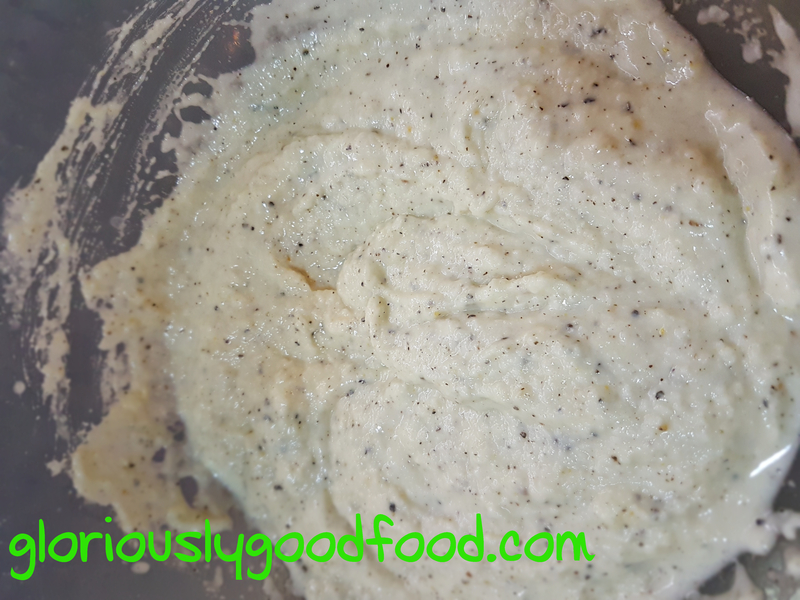 How much you use, will depend on taste, but you are ideally aiming for a speckled look to the cheese, and for a good peppery kick to the sauce. Once the pasta is nearly cooked (about a minute before it’s done), take a bit of water out of the pan with a ladle and stir it into the cheese with a fork. Add a bit at a time (half a ladle or less) and stir each time, until you achieve the desired creamy consistency. This is what you are aiming for with the pecorino, pepper and cooking water. Once the pasta is cooked, nicely ‘al dente’, drain it and immediately stir it through the cheese. Serve onto pasta bowls and, if you wish, add a bit more freshly-ground black pepper. Cacio e pepe pasta. Gloriously Simple. Gloriously Good! This sauce is an alternative to traditional bolognese sauce, using roasted sweet pepper sauce instead of tomatoes. It is not only reflux*-friendly and low-fat, but so delicious, I think I might actually like it more than traditional bolognese sauce!!! I am usually very critical of using garlic in a bolognese sauce – it should just be ‘soffritto’ (finely chopped carrots, celery and onions, fried off in olive oil), beef, tomatoes and salt. And of course if, as a reflux sufferer, garlic affects you, then you can make the roasted sweet pepper sauce without garlic – simply roast the peppers with a drizzle of olive oil and a sprinkling of fine sea salt (don’t use herbs as they’ll affect the taste of the bolognese sauce!). But, if you can tolerate roasted garlic, then it’s well worth sticking to using it in the pepper sauce as it adds extra depth of flavour. 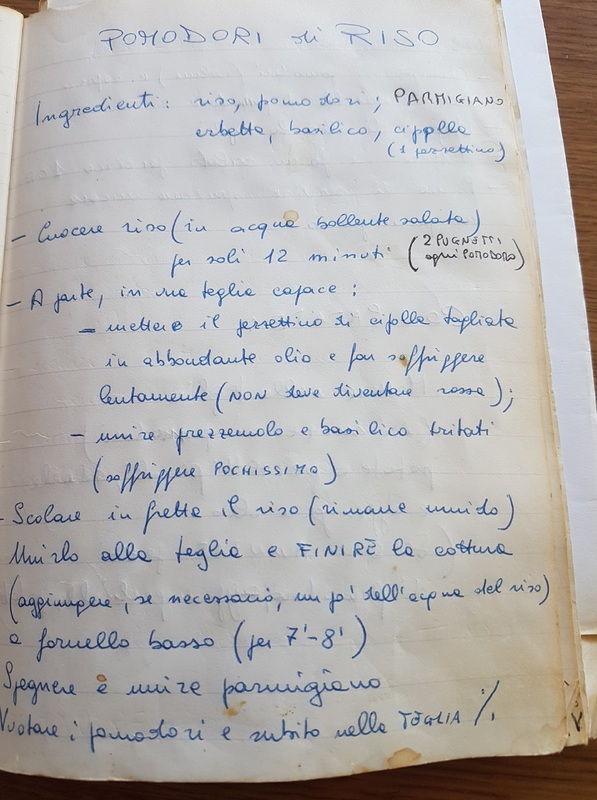 If you have already made the roasted sweet pepper sauce, the bolognese is very quick to make, so put on your pasta water (with a good handful of coarse sea salt and a drop of oil, of course) before you start. Your sauce will be ready even before your pasta is cooked. Turn the heat up to high and add the minced meat with a sprinkling of salt. Separate the meat as you brown it, making sure it doesn’t form big clumps. Once the meat is browned, add enough roasted sweet pepper sauce to get the desired sauce consistency. Turn the heat down and simmer for 5 minutes, until the sauce is piping hot and the meat is cooked through. Serve with your pasta – cooked ‘al dente’, of course!